On April 10th, Trump issued an Executive Order that limits states’ ability to protect their own water resources from harmful pipelines and other dirty energy projects. His Executive Order is just the latest in a long list of polluter handouts that undermine our nation’s bedrock water law, the Clean Water Act. In February, the administration formally proposed a rule it’s calling one of “the most economically significant deregulatory actions for energy.” This proposal, the aptly labeled Dirty Water Rule, would eliminate Clean Water Act protections for over half of our nation’s wetlands and for a significant number of streams—anywhere from 20-70 percent of stream miles nationwide depending on the final version of the rule. The Dirty Water Rule is a huge gift to fossil fuel giants because it would allow them to destroy wetlands and pollute streams without permits or pollution controls. Read my colleague Andrew Grinberg’s blog to learn more about how this industry benefits from lax clean water safeguards. Wiping out clean water protections for streams and wetlands is a radical shift from science and law and undermines the very purpose of the 1972 Clean Water Act—to “restore and maintain the chemical, physical, and biological integrity of the Nation’s waters.” Once these streams and wetlands are destroyed they can’t be fully recovered, and the critical water quality functions they provide—filtering pollutants, capturing nitrogen and phosphorus that fuel toxic algae outbreaks, and storing floodwaters that threaten property, people, and infrastructure—are lost. Small streams also feed the drinking water sources that most of us rely on every single day. Our drinking water sources are only as clean as the sources that feed them, and it’s reckless of Trump’s EPA to allow corporations to pollute these streams at our expense. While we can’t submit comments on executive orders, we can on proposed rules. Robust public participation is at the very heart of the Clean Water Act—all of us have the right to demand fishable, swimmable, and drinkable water. The Trump administration has given us a paltry 60 days to comment on its Dirty Water Rule—despite numerous requests to extend the public comment period from Congress, public interest groups, state water associations and others. Please take a moment to tell Trump’s EPA that you reject its Dirty Water Rule. You can learn more about this proposal on Clean Water Action’s website and you can submit your own comment here. 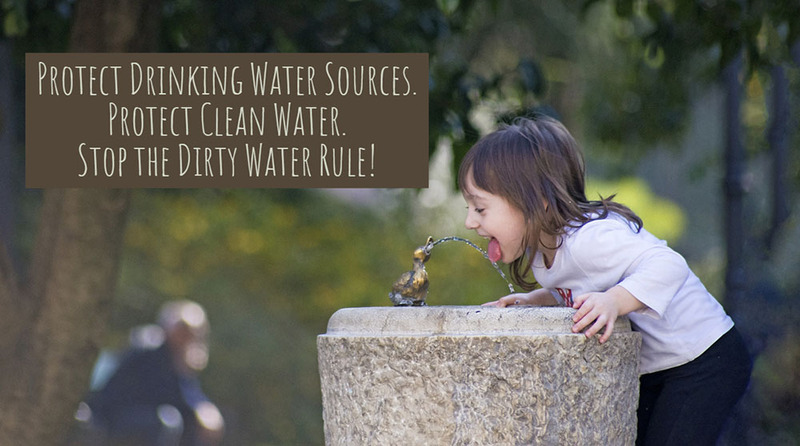 Please speak up for clean water by April 15th!